Professional organizer Marie Kondo’s The Life-Changing Magic of Tidying Up: The Japanese Art of Decluttering and Organizing has been topping nonfiction bestseller lists for months now, and for good reason. Her methods differ from what readers might find in other organization books. Rather than offering tips on storage and how to maximize space, she instead urges readers to discard any items that don’t “spark joy.” The ultimate goal is to have a particular spot in the home for every remaining item. Theoretically, one never has to organize again. If taken seriously, Kondo’s book has the potential to live up to its title; her methods really can be life-changing. As I read my way through the book, I spent a month going through everything I own and carefully deciding what to keep. After selling or donating at least fifteen garbage bags full of items, my dresser drawers, closet space, and book shelves have opened up. (I’m not alone, since consignment shops and used bookstores around the country have seen an influx of recent donations due to the “Kondo effect.”) I found it especially helpful to consider each item individually, analyzing whether it really brings me happiness right now, regardless of its cost, who gave it to me, its past sentimental value, or its potential usefulness. I also love the way my dresser looks after following Kondo’s advice to store folded clothing upright in the drawer so that you can see everything at once and remove an item without displacing anything else. In general, I feel more relaxed in my space and have found it much easier to keep things tidy. Perhaps the most eye-opening aspect for me of reading Kondo’s book and following her instructions has been how great it has felt to get rid of things. I expected to feel guilty or anxious, but instead, just as The Life-Changing Magic of Tidying Up promises, I felt only relief. I definitely found Kondo’s tendency to anthropomorphize belongings a little foreign (she talks about storing items in ways that will make them happy and recommends verbally thanking possessions before discarding them), but there is something strangely freeing about acknowledging what a particular possession has done for you and then letting it go. Decluttering may well become a way of life after reading this book. I just finished reading this book and cannot wait to embark on my tidying experience. Already I've got things in mind that I've been saving for one reason or another, and I feel like after reading Kondo's book I'm finally ready to let those things go and am in the right frame of mind to do so. Additionally, this is something I'd been reading out loud to my husband, so without even prodding I've got him on board also. This has been a great book to get us discussing what is or isn't important in our house, and preparing us to downsize as we prepare for future moving. Like many before me, I have become a KonMarie believer. I have always been a tidy person and many of her methods are familiar and resonated with me. But as I have gotten older I have started to amass a lot of junk (so many clothes!) and my life needs to tidy up. As I read, I started thinking of all the things to discard and organize and I felt hopeful anticipating the sense of relief when that will happen. I was especially intrigued by the order of tidying up and specific directions of what to do with all the miscellaneous things. I have often started organizing with that kind of stuff, getting bogged down in the memorabilia, and not actually throwing much away. I did start to feel overwhelmed as I read the entire book and hadn't actually started my epic de-cluttering project. I would recommend reading it in parts and following her steps chapter by chapter cleaning out as you go. 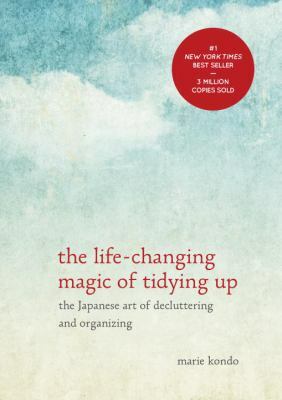 Kondo can definitely come across as an oddity in this book because so much of her life has been obsessed with tidying. Some of her input is very culturally specific to Japan, so it can be taken with a grain of salt and applied in different ways to individuals. I am a big proponent of donating and recycling and Kondo seems to emphasize the trash aspect of tidying up. So instead of just discarding haphazardly, I like the idea of asking yourself if the object sparks joy and then wishing it well on its journey... to DI or the recycle bin. I recently read this book (ok, I listened to the audiobook). I knew I wanted to declutter my room when I picked this book, but I didn't realize it would also help declutter my mind. Kondo does a wonderful job at teaching to let go of the things that you don't need or have served their purpose. Learning the principle of gratitude and letting go was life-changing when applied to my physical belongings. Her book even inspired me (a huge pack rat) to donate my favorite shirt.